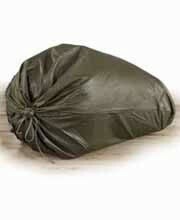 Manufacturer: Harris Manufacturing Co. Inc.
Keep stuff dry in this U.S. Mil. Large Waterproof Alice Pack Liner! The answer for things meant to stay dry. You'll find over 101 uses for it, from carrying camping gear like sleeping bags and tents to hunting gear like decoys and ammo. O.D. rubberized Bag is constructed with a nylon rip-stop material inside. Drawstring cinch tie top. Measures 24 x 32 inches.